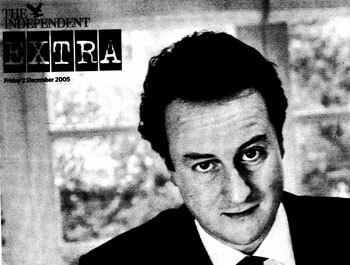 You can expect the profiles of David Cameron to come thick and fast now. Last night's Channel Four News was quick off the mark with a brief profile and you can watch that by clicking here. Today's Indy offers an eight page pullout profile by Malcolm Macalister Hall and, unusually, for features in that newspaper it's all online. "Some people have suggested adding a word, but I don't think it's actually the answer. I mean, look at Tesco - that used to be the cheap crappy supermarket, and over time it's transformed itself, and it didn't change its name." (1) "It's about making sure the party reflects the country; which is about the representation of women, and appealing to young people, and getting back into the cities." (2) "It's expanding the policy portfolio to encompass things like climate change." (3) "And the third thing is all the key principles, and trying to explain what they mean today: that 'low taxes' doesn't mean tax cuts for the rich - it means keeping taxes down to have a competitive economy and jobs for all." I know all indications are that he will win but he hasn't won yet - isn't this a bit premature - but then again the British press did their obituaries before the poor sod breathed his last. I meant George Best, not David Davis! Maybe Michael Howard should rename the party "Crappy Conservatives" just for the weekend. It reflects our new compassionate agenda. How will be carry out stage 1? Is he indicating that he is looking to parachute more socially diverse candidates into seats? I dont like the sound of it. By stage 2 does that mean being all things to all men? By stage stage 3 does he mean do what weve been doing since Thatcher came in? Im disappointed by this. As Tom Jones famously said "Whats new pussycat?" (3) "And the third thing is all the key principles, and trying to explain what they mean today: that 'low taxes' doesn't mean tax cuts for the rich - it means keeping taxes down to have a competitive economy and jobs for all."" It's a good case study - I remember presenting to my senior mgt why Tesco should be the model rather than the then flavour of the moment Marks & Spencers. 1 &2 Tescos diversified and its product range was representative of the local market - stores in garrison towns with lots of squaddies have lots of tesco Value, where more ABs then lots of Finest stuff. - so it became a competitor to both Safeways and Sainsbury's then Marks. Anything wrong with our party becoming more reflective of the local areas and looking to a range of candidates and policies with broad appeal? 3 You don't undermine the basic brand values - Tesco remains at base an offer of value. The Conservative Party a party of personal responsibility, support for social cohesion, low tax, less government. Whats new is how you explain or implement those - simplifying pensions for example. Spot on about broadening our policy to encompass serious thought about climate change, I would add International Development to this too. These are two fields in which we can be seen to be tangibly concerned about things other than personal interest. The only serious Conservative account of green issues I've ever seen was by Anthony Uskglass in the Cornerstone booklet - but I've heard nothing of him since. Where is Uskglass? Why is he hiding? If only we could dominate like Tesco's! I have no problem with being more reflective of Britain as it is. My fear is that by trying to be reflective of Britain the Party will impose candidates on constituencies (Cameron favours a "goldlist") which would look fake and which the electorate will not have any knowledge of. The key to winning by-elections is having local candidates with a knowledge of the area and a good reputation in that area ready for the election. The electorate loves people they already know because trust has been established. Of course I cant prove that but Im having no problems down here in my ward at all on this respect. I guess we'll know if my theory is right or not come May 2007. What's wrong with tax cuts for the rich - amongst others? I'm a bit worried about the female representation point. Picking poor candidates is not the cure for the party, its deeper than that - the party needs to recruit far more women at a more junior level, who in time will become candidates. Remember Consignia? name-changing for the sake of it never works. Conservatives is a good brand. Just needs a strap line. You can tell how the values of ad and marketing men have permeated politics when you see people lauding Tesco. To compare national institutions with retailers shows the complete vacuity of modern politics. Once Politics was aligned with The Church and words like "Minister", "Belief", "Mission", and "Dedication" were carried over into the political domain..............now t is tha language of consumerism "buy one get one free", "special offer", "cash-back"...........and politics is now despised as a get-rich-quick scheme for politicians and basically a scam against the public good, just like Tesco. Guido's heart is in the right place but he is such a dedicated follower of fashion that he loves DC and hates DD. He knows it's wrong, he knows DC doesn't agree with him, but it is just too much for him to be unfashionable, to be, on this one, on the losing side, so he will just fall into line with everyone else. This is wrong because, in the end, being right matters more than being "cool," Guido knows this but daren't admit it.